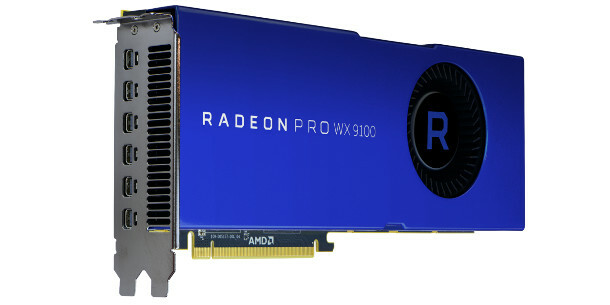 AMD has announced the Radeon Pro WX 9100, its new top-of-the-range workstation GPU, alongside a new version of the Radeon Pro SSG, its experimental workstation card with 2TB of on-board solid state memory. Both new cards were announced at Siggraph 2017 last week, and are due to ship in September. The more conventional of the two cards, the Radeon Pro WX 9100, fills out the top end of AMD’s current Radeon Pro WX series of workstation GPUs, launched last year with the WX 7100, 5100 and 4100. Unlike the existing WX Series cards, it’s based on AMD’s new Vega architecture, which means that it uses high-bandwidth HBM2 memory rather than GDDR5. Its other specs are also, arguably, rather better than you’d expect by simply extrapolating from the existing WX Series cards: the WX 9100 has a peak single-precision floating point compute performance of 12.3 Tflops and 16GB of VRAM, as opposed to 5.7 Tflops and 8GB of VRAM for the WX 7100. For connectivity, you get six DisplayPort outputs, as opposed to four for the WX 7100. On paper, that puts it on a par with Nvidia’s new Quadro GP100, which also features 16GB of HMB2, 10.3 Tflops of peak single-precision floating-point performance, and four DisplayPort outputs, plus one DVD-D. However, it’s likely to be rather cheaper: whereas the Quadro GP100 has a current MSRP of $8,899, the WX 9100’s predecessor, the Fire Pro W9100, used to sell for around half that price. Updated: It’s considerably cheaper. AMD has confirmed the MSRP of the WX 9100 as $2,199. 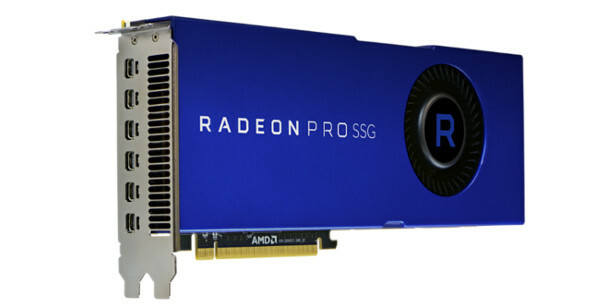 AMD also announced a rather less conventional workstation GPU: the new edition of the Radeon Pro SSG – the “world’s first GPU to break the Terabyte memory barrier”. The card, which got a limited developer kit release last year in its original 1TB edition, features a massive 2TB on-board cache of solid state memory, in addition to 16GB of conventional VRAM. Although the solid state memory isn’t likely to provide the same performance as native memory, AMD claims that the data transfer speed is good enough for tasks like scrubbing through 8K video in real time. To that end, AMD is “working very closely” with Adobe to implement the SSG API code within Creative Cloud, to make applications like Premiere Pro and After Effects natively SSG-aware. Aside from that, the SSG has similar specs to the WX 9100: 12.3 Tflops of peak single-precision floating-point performance, and six DisplayPort connectors. The Radeon Pro WX 9100 and Radeon Pro SSG are due to become available in stores on 13 September 2017. The WX 9100 has an expected MSRP of $2,199 and the SSG an expected MSRP of $6,999.